JPMorgan: "We See Risk Of Institutional Capitulation"
One week ago, JPMorgan - which at the start of March warned that based on the recent "erratic behavior of retail investors" the idea that retail investors will serve as the marginal buyer of equities in the current environment was in jeopardy - found some solace in that week's record equity ETF inflows of over $40 billion, which suggested to the bank that retail investors are once again the "marginal buyer of equities" even as institutional investors continued to quietly sell their equity holdings. 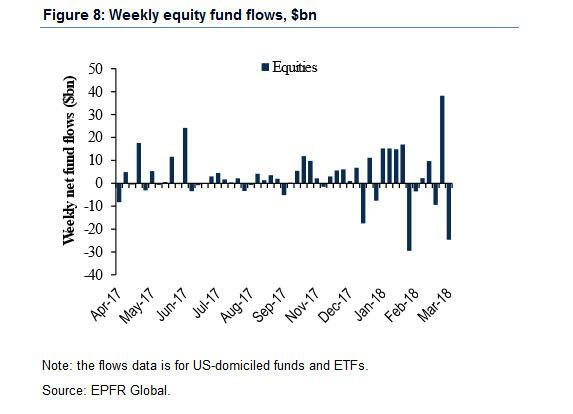 However, being a fickle, momentum-chasing bunch, it did not take long for mom and pop retail investor to pull a 180 and for record inflows to turn into near-record outflows, because as we reported yesterday using the latest EPFR data, last week saw $20 billion in equity fund outflows, the second highest on record, and only smaller compared to the record outflows observed in the February 5 VIXplosion week when countless retail vol-sellers were crucified instantly when XIV experienced an "acceleration event." 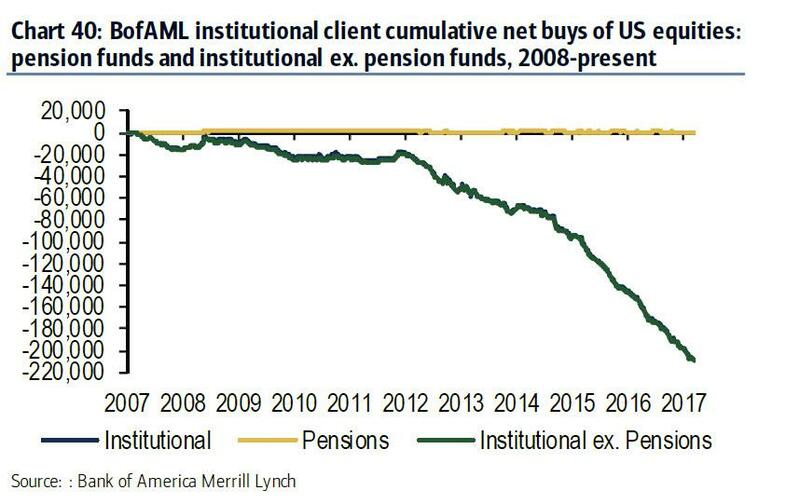 Meanwhile, more ominously, JPM had noted that no matter what retail investors did, institutions appeared to have no interest in re-entering the market, on the contrary, they appeared to be quietly liquidating to retail investors, a trend which incidentally started around the time of the last market peak in 2007, and hasn't changed since. Well, it's only logical that if institutions didn't like the market last week when it was levitating on no volume back to all time high, then they certainly would not like it this week, when the Dow Jones reentered a correction, down over 10% from the January 26 high. And, as JPM's NIck Panigirtzoglou wrote late on Friday in his latest "Flows and Liquidity" report, "Institutional investors continued to act as a drag for the equity market and if anything they appear to have turned even more cautious over the past week." This is shown in the table below which lays out the equity beta for various institutional investors, from Equity L/S, to Macro, to CTA, to risk parity and concludes with balanced (60/40 equity bond) mutual funds. The table shows that all betas declined in the most recent period between March 13th to March 21st, indicating ongoing equity unwinds and deleveraging. More notably, Risk Parity funds saw a sharp decline in their beta over the past week in response to the rise in volatility, while both Macro and CTA funds now appear to have taken an outright net short position as their betas turned negative in the last week. Macro forces have turned less supportive. The cyclical momentum of the global economy appears to be downshifting as suggested by this week’s flash PMIs. And an apparent escalation of trade wars is increasing macro downside risks. 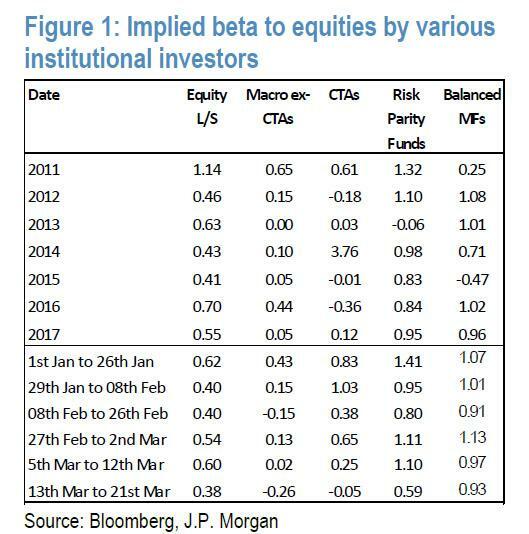 Institutional investors think upward momentum in equity markets appears broken. As a result, chasing long-term equity momentum no longer looks as attractive as an investment strategy. Equity valuations are still frothy, and therefore the 9% correction so far since the Jan 26th peak appears not enough to trigger “buy the dip” flows. Whatever the reasons for this stubbornly cautious stance by institutional investors, Panigirtzoglou warns that it is emerging as a headwind for equity markets. 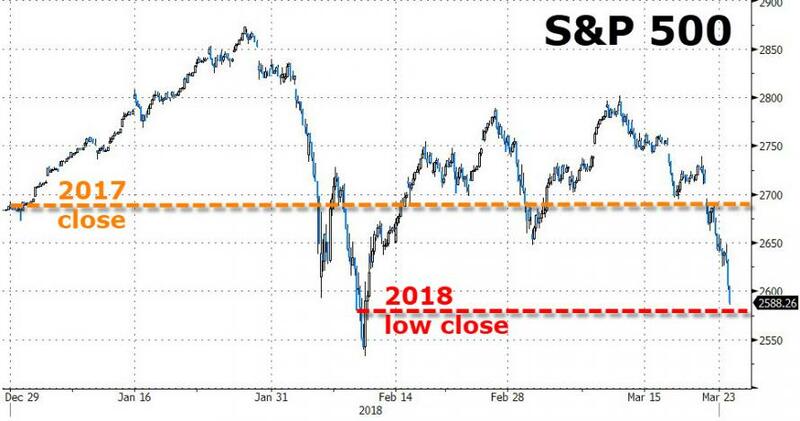 Here JPM's flows expert picks up where JPM's chief technical analyst, Jason Hunter, left off yesterday, when as a reminder Hunter cautioned that should the S&P slide below 2,610, that clients should reduce exposure to the S&P (the S&P closed Friday at 2,588, just above the 200DMA of 2,585). So what happens next according? According to the JPM strategist "the biggest near-term risk for equity markets is a breach of the lows we saw on Thursday, Feb 8th" and adds that "anecdotally, during that Thursday, fundamental equity investors came close to capitulation, so revisiting these lows raises the risk of capitulation, in our view, and thus of a more serious correction beyond the 10% decline seen between January 26th and February 8th." As the chart below shows, we are nearly there. What about retail investors: could they again step in and provide an offset to the "cautious" stance of institutional investors? 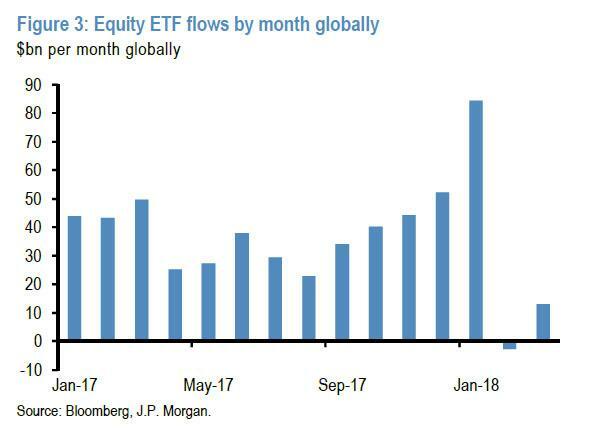 Unlikely: according to JPM, when looking through the volatility of weekly equity ETF flows, the big picture is that following an interruption in February, retail investors have resumed their equity ETF buying in March. However as we noted up top, March’s buying pace is not only increasingly extreme in both directions, but also "looks too weak to propel the equity market, especially compared to previous months before the February correction" according to JPM. As such, with both institutions and retail investors out, and corporate bond yields jumping making buybacks increasingly expensive, suddenly the question of who will buy as everyone else sells has no satisfactory answer. To summarize, JPM is becoming increasingly worried that "the stubbornly cautious stance by institutional investors is emerging as an important headwind for equity markets in the near term", and what's worse, should the S&P drop another 1-2%, and take out not only the 200DMA but also the early Feb lows, it looks virtually certain that institutions, which refused to liquidate during the vol explosion last month, will not show similar patience this time around.